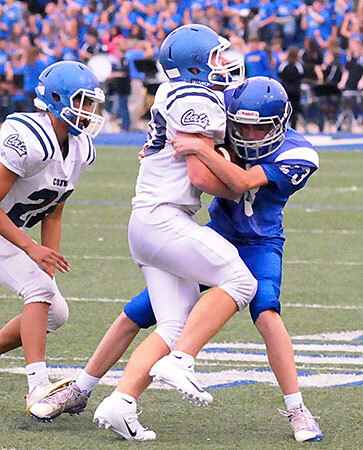 The Bryant Blue Hornets eighth grade team of Bethel Middle School had forced a three-and-out from the Conway Blue Wampus Cats then, overcoming a false start penalty, had picked up consecutive first downs on offense. Quarterback Tyler Pinney had hit Evan Lamb for a 13-yard completion then running back Xalen Currenton had slashed for 7 yards and a first down then 10 more for another. But, from that point until the end of the first half, nothing went right for the Hornets. Conway Blue scored 32 points including a touchdown with no time left in the half on the way to a 38-0 victory over the Hornets. It was Bethel’s first loss of the young season. 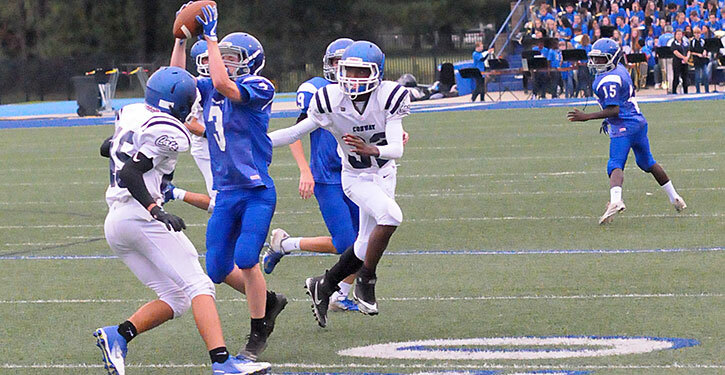 Now 2-1, the Hornets host El Dorado next Thursday, prior to the freshman game against Little Rock Catholic. Conway stopped that Bethel drive at the 43 and took over on downs. Keyed by a 31-yard run by Romarrion Fields on a third-and-4 at the Cats’ 39, they drove for the first score of the game. Will Vint got in the end zone from 8 yards out on the third play of the second quarter. Kindin Millwood ran in the two-point conversion. 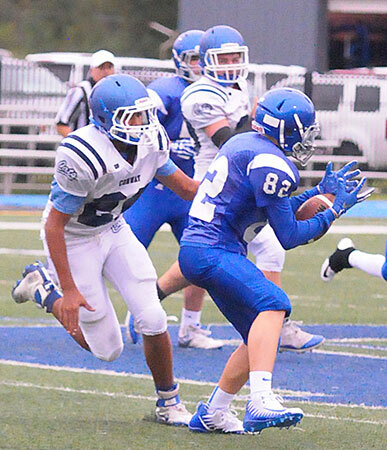 The Hornets made a bid at answering when Xalen Currenton broke a 16-yard run into Conway territory. But a holding penalty negated the run and they weren’t able to overcome it despite Pinney’s 11-yard completion to Jonathan White. On the next snap, Conway Blue’s Jalen McKinney intercepted a pass at the 32. 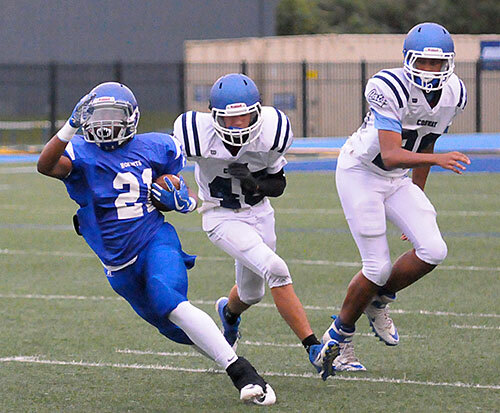 The Cats scored on the next play as Millwood broke a 68-yard run. Sanders ran in the conversion and it was suddenly 16-0. McKinney’s second interception came on the second play of the Hornets next series. This time, he returned it 29 yards for another TD. Sanders threw to Kyler Spencer for the two-point conversion and it was 24-0 with 2:18 left in the half. The Hornets’ frustration on offense continued and when a fourth-down pass fell incomplete, Conway Blue took over with :04.1 left in the half. The Cats got a snap before the buzzer ended the half and Millwood raced 35 yards to another touchdown. His two-point run made it 32-0. The Hornets started the second half with a 39-yard completion from Pinney to Joshua Luster on a bubble screen. 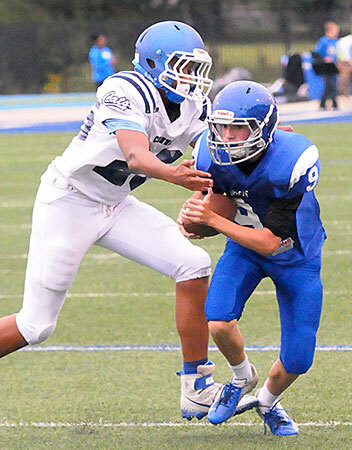 At the Conway Blue 27, however, they were unable to pick up any more yardage and the Cats took over on downs. 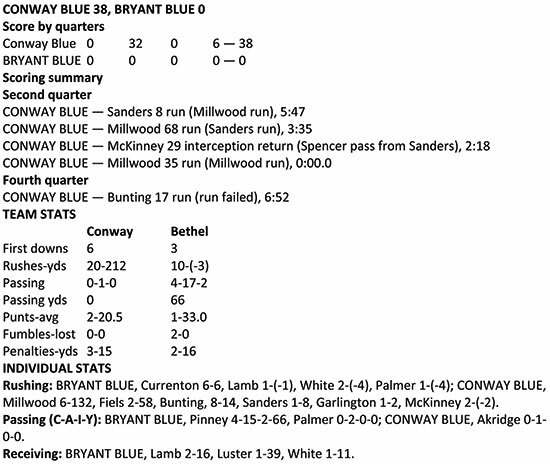 The teams traded punts then Conway Blue put the capper on the win as Bryce Buntin followed up a 27-yard run by Fields with a 17-yard dash to the end zone. The Hornets were without stellar running back Dominique Gatson, a move-in prior to the season. Apparently, Gatson and his family moved back to Texas.